This is the third in a series of previews of the Masters races in the upcoming USATF Club Cross Country Championships this coming Saturday in Tallahassee Florida. So far the forecast for a clear but cold morning has softened a bit. They are now forecasting 35 degrees for the start of the Women's race at 8 am. 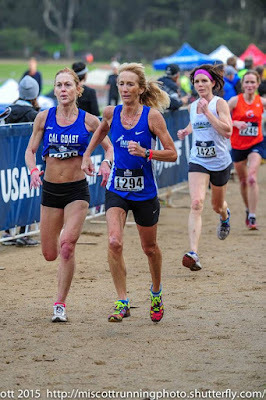 This preview focuses on the individual races for the age groups 60-64, 65-69 and up. 60-64. Kathy Martin took this division with a minute to spare last year but she has aged up to the next division. That should leave it wide open for Mo Bartley who finished 2nd last year in 25:47. Her biggest threat probably comes from Debbie Lee who was in the 55-59 group last year and came across the finish line about a half minute behind Bartley. Claire McManus was also in the W55 group last year, finishing about a minute back from Lee and 16 seconds ahead of Jill Miller-Robinett. Miller-Robinett has run well this fall, winning medals at each of the three national championships she has contested, from 1 Mile to 15K. 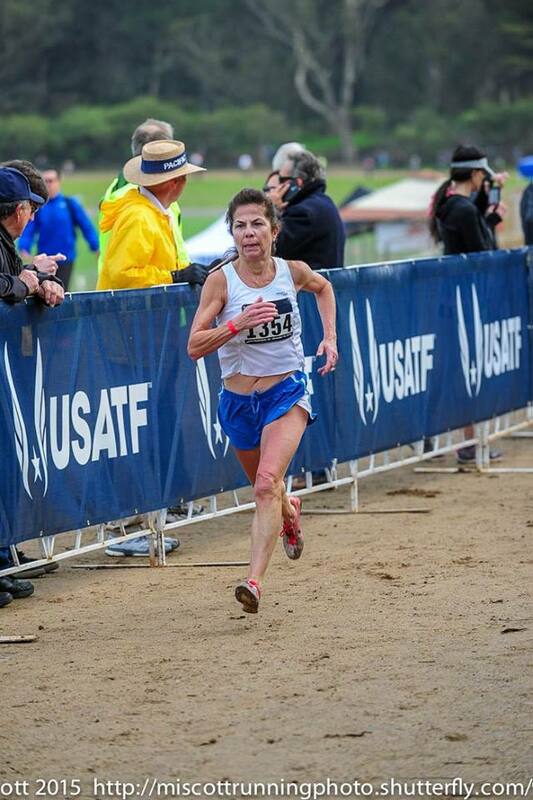 Cynthia Williams may also factor in; she took 1st last month in the 5 km XC at Tallahassee. Terry Ozell took 3rd at Tallahassee and may also be in the mix. 65-69. Although this division is short on entries, it is long in competition. Eleven-time Harrier of the Year, Kathy Martin, competes for the first time in Cross Country as a 65 year old. She has already broken an American road record at Syracuse in the 5K Championship, and competed in the World Masters Athletics Championships at Perth Australia where she set World Records in the 5000 meters and the 2000 meter steeplechase, and an American record in the 10,000 meters. She also broke the record in the 800 while finishing 2nd to Sabra Harvey, who is also in this field. All together, Martin competed in six events, bringing home 4 gold and two silver medals. No other woman has beaten Martin in recent years so there will be a lot of interest in this race. Harvey took gold in the 800 meters and 1500 meters at the, while finishing 2nd to martin in the 5000 meters. Most likely Martin will have the edge on the turf over the longer distance. Last year Martin came in a minute and a half ahead of Harvey. But Harvey may be running a little stronger this year so look for a closer race. Hat's off to these two great international competitors for the USA! There will be a spirited competition for the third spot on the podium as well. 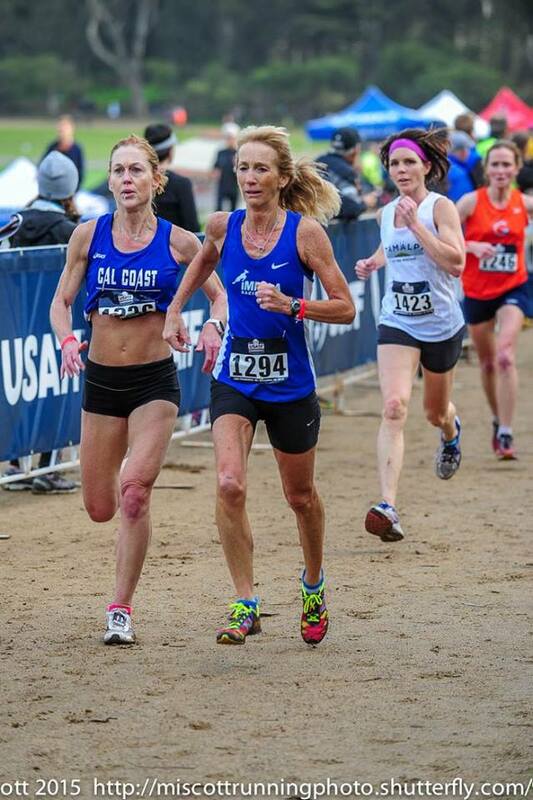 Cindy Ingalls finished 12th at Club XC last year and she also ran 22:43 at the 2015 USATF 5K Championships at Syracuse. This year she has recently run several trail runs, most over 15K in length. Nonie Hudnall, who finished 4th at the 5K Championship this year in 23:42, will push her all the way. And we should not forget Ingalls's teammate, Jeanne Herrick who finished only 12 seconds back from Ingalls in a 5K trail run. 70-74. Dianne Anderson is primarily in Tallahassee to help her Impala 60+ team to victory. In the process she will pick up the individual women's 70-74 gold medal as she is unopposed. 75-79. The Morris County Striders no longer send a team to this contest but that will not stop Madeline Bost from running the race, claiming the gold medal and getting enough points to win the W75 Individual Grand Prix. On a final note, it is good to see a GVH 60's team back in action. We welcome Herrick, Ingalls, and Moore back and hope that we see them more often in the coming year! 60-64. Two-time Runner of the Year a few years back, Brian Pilcher is breaking American records left and right this autumn. He set the 5K mark for this age division with a 16:36, as part of his taper for the Chicago Marathon which he ran one week later. When he ran the Chicago Marathon he messed up on his pacing and almost missed the Marathon record by pushing too hard early in the race. Nonetheless he got 4 records in one try as he crossed the Half Marathon timing pad, the 25K and the 30K pads in record time on the way to tying the 2:42:44 record of Clive Davies which had stood for 37 years. He is entered and is likely to win this division by a big margin. John Barbour will make sure it is an honest pace. Last year he and Rick Becker had quite a duel as they were inseparable until the last portion of the race when Becker finally pulled away. Barbour, despite running a fine 38:04, finished 3 minutes back from Pilcher in the USATF 10K Championship in Dedham MA in April. It looks as if Dan Spale might be the only other runner who can hang with Barbour. Spale ran a 38:41 at the Bolder Boulder 10K, which is considered tougher than the Dedham course. Spale also had a nice 2nd place to Pilcher in the 15K Championship at Tulsa where he ran 1:00:26 to Pilcher's 55:17 on a tough, hilly course on a hot day. Last year at Club Cross there was a string of runners behind Becker and Barbour that only separated in the last half mile, in order Mark Rybinski, Reno Stirrat, Doug Steedman, Tom Bernhard, and John Victoria. Steedman and Bernhard have run well lately. In fact Bernhard set the 5K record for Men 65 and up at 17:31. But neither is entered. Victoria has struggled with back issues ever since this time last year. Rybinski and Stirrat are both entered but probably neither is at the level they were at last year. Rybinski has been coming back from a hamstring issue and has been gradually improving throughout the autumn. Still, at the 5 km Masters XC Championship at Tallahassee, he only finished 6th in a field much lighter than the one he will face this time. On the other hand he has had another month of training which may have elevated his fitness. Reno Stirrat has had an unexpected autumn. A freak accident while walking the dog left him with his foot in a boot in early October. When he had put that behind him and resumed training and racing, he could tell things were not right and checked in with his doctor; he has a heart issue. It is unclear how serious it is. 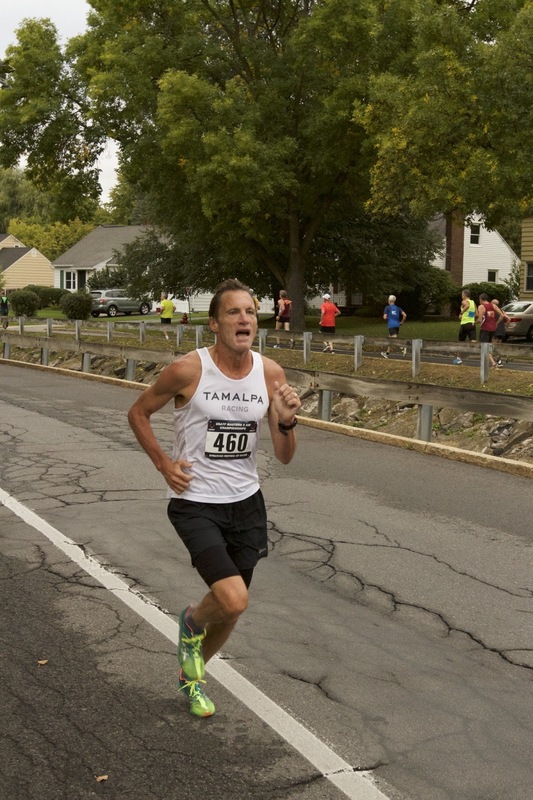 He is training and racing under the watchful eye of Paul Thompson, M.D., the "Running Cardiologist" of Runners World fame and a former college teammate of mine. But Stirrat's training was interrupted and then controlled, so it seems unlikely he is at full speed. Who else might contend for the podium? Pilcher's teammate, Mark Richtman, is primarily a trail runner. At the Tamalpa Challenge recently, Richtman finished only 10 seconds behind Steedman so he may be able to race with Barbour and Spale. Another runner who could play a role is Gary Radford; he has been running well this fall. 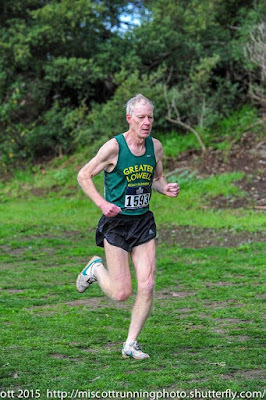 He aged up between Syracuse, where he was 11th among Men 55-59 but would have been 3 seconds out of 3rd in the M60 ranks; in the Masters 5km XC race in Tallahassee Radford finished 2nd to Tom McCormack. 65-69. Tom Bernhard, who has already set one M65 record this year is not contesting this event. So will this be a replay of the USATF 10K Championship in Dedham MA? At that race, Doug Winn took the honors in 38:23, followed by Doug Bell a half minute back and then Peter Mullin kicking away from William Dixon to claim 3rd in 39:41. It was Winn and Dixon 1-2 at Club Cross last year. Winn should take the honors again this year. But it looks like quite a duel between Bell and Mullin. While Bell took the honors in the spring, Mullin came back at the 5K Championship in Syracuse and reversed the order of finish, earning a 16 second advantage over Bell. Who else might contend if any of those falter? Kirk Larson aged up from last year when he finished 31st among the 60-64 year olds at Club Cross. But his time would have earned a 3rd spot in the M65 group. He ran well at Tallahassee last month where he earned a 2nd to Bell. Other strong runners in the mix include Dixon Cook, Jerry Learned, and Doc Rappole. 70-74. Gary Patton, who has wrapped up the Grand Prix title and a share of the Age Division Runner of the Year, is finishing off a stellar 2016 by getting in shape for his first love, Track and Field. The Indoor season is not far off! 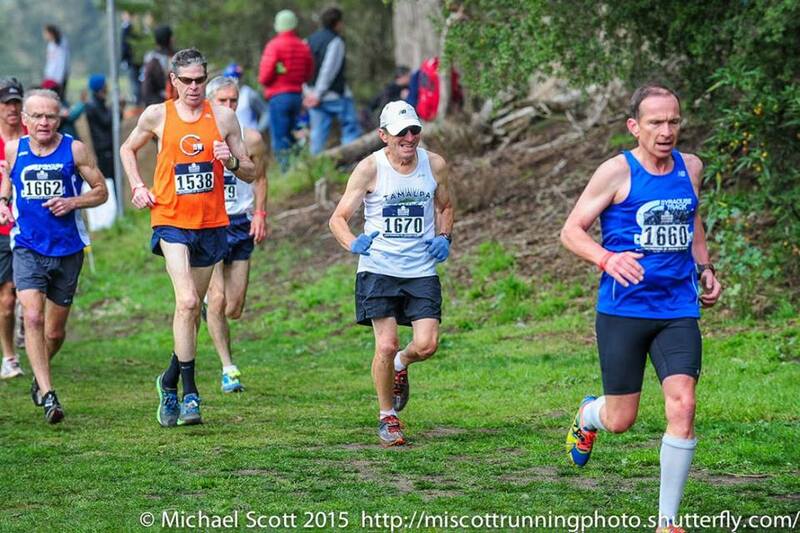 The defending Club XC Champion, Len Goldman, is returning and has been running well. He ran 20:26 on a fast 5K and matched up against his strong Tamalpa teammate, Donald Porteous, losing to him by 10 seconds in a 4-miler. Porteous, by the way, has aged up since last year when he finished 7 seconds behind Goldman at Club Cross. The return of the Silver Bullet, Doug Goodhue, from injury makes things more interesting. The multi-time Age Division of the Year winner, who dominated his division for years, is now in the process of bouncing back from an injury that has hampered him off and on recently. 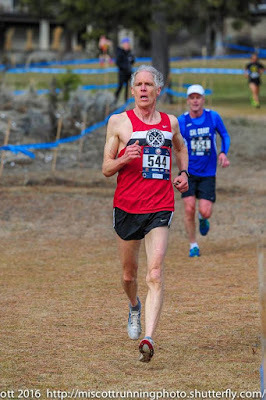 Still not at his best, he, nonetheless, took the title at the USATF 5K Masters XC Championship in Tallahassee, holding off Przemek Nowicki and Jan Frisby to win by 18 seconds. Ronald Wells has also been running well this fall with four 5K's since August ranging from 20:12 to 20:59. He aged up this year; at the Brea 8K in February he finished 4 seconds ahead of Goldman. Other strong runners who could play a role include Paul Carlin (yours truly), Ron Enos, Jan Frisby, and Jim May. Nowicki would be in that list but is taking the end of the year off in an effort to get past the glute/hamstring issues that have hampered him in recent months. I took the M70 title at Dedham in 42:19 but have been hampered by hamstring and adductor issues since then. A 21:35 at Syracuse looked like a good step forward but there were minor setbacks after. Enos took 2nd at Club Cross last year and is always a threat; his 5K times this year have been a little off his best. Frisby who won everything in sight in this division in the first half of 2015, has not found that level of fitness since. But he has been been improving all year and ran a recent 5K that was a minute faster than his 6th place time at Syracuse. May finished 3rd at Syracuse in 20:53 and is always right there; he should not be ignored. Goodhue proved me wrong last month; he is a fierce competitor. 75-79. Hans Schmid won this race in San Francisco but he is not making the trip. Ron Mastin finished 2nd but has been battling injuries all year and will now focus on healing up so he can have a better 2017. In their absence, this race should come down to a battle between John Elliott and David Turner. In 2014 Elliot won the USATF 5K Championship in 23:30; in 2015 he won the 12K Championship in 1:00:40. He ran a 25:30 5K last year and recently ran the Navy Mile in 7:55. David Turner took first at the USATF 5K Masters XC championship in Tallahassee last month in 25:59. As Cross Country races tend to be a little slower than road races, that puts Turner right with Elliott in the lead pack. Andrew Sherwood who finished 2nd to Turner in 29:20 looks like the favorite for the third and last podium spot. Phillip Kroll, who prefers longer races, and Al Swan will try hard to crack the top 3.